A phrase like this is exactly why we started our business – not only do money issues matter, but MORE importantly, spiritual truth matters. Honestly, I started this post the SAME DAY because I was upset. I was feeling a LOT of things. When Khaleef came home, I rallied him into doing a Periscope with me on the subject! But I’m glad that I’ve had time to settle down and really think about what should be said about this. 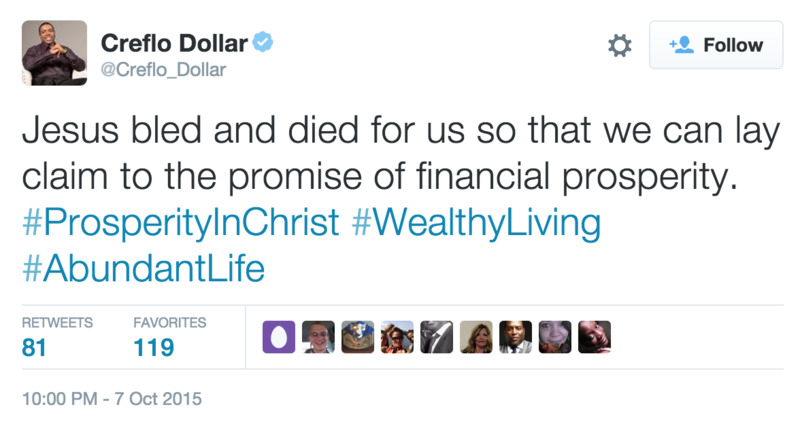 To be honest, Creflo Dollar’s statement shouldn’t be alarming because it’s the same message he and others have been sounding for at least three decades and since the recession, thankfully, more Christians have evaluated their thinking about God and the long-term effects of that theology. But what still needs to be addressed, in my opinion, and magnified, is the reason why Christ did die. The truth of the gospel is what matters. Khaleef and I believe that if you get the gospel right – if you get Christ right, then everything else He gives will help you to get the other things right, like your finances. So we need to start here. As He went to the cross and fulfilled what He set out to do before the world began — based on these things expressed so beautifully in the scriptures, I am assured that temporal comfort or success for you and me was not on His mind. The magnitude of Christ’s death can not be fully understood while we are on this earth, but the bible does allow us to see some important points on why He had to bleed and die for us. 16 For where a will is involved, the death of the one who made it must be established. 17 For a will takes effect only at death, since it is not in force as long as the one who made it is alive. 21 And in the same way he sprinkled with the blood both the tent and all the vessels used in worship. From both these passages we see that the significance of Christ shedding His blood had to do with the Old Testament sacrifices and the protocol that God put in place so the transgressions (sins) of the people would be forgiven. These sacrifices were temporary and were powerless to free us from sin. Christ served as our sacrificial Lamb, His sacrifice being perfect, lasting, and eternal. Christ’s blood had to be shed for the perpetual forgiveness of sins. Period. 1. He died so we can be reconciled back to God. 10 For if while we were enemies we were reconciled to God by the death of his Son, much more, now that we are reconciled, shall we be saved by his life. 17 Therefore, if anyone is in Christ, he is a new creation. The old has passed away; behold, the new has come. 18 All this is from God, who through Christ reconciled us to himself and gave us the ministry of reconciliation; 19 that is, in Christ[,] God was reconciling the world to himself, not counting their trespasses against them, and entrusting to us the message of reconciliation. 19 For it was the Father’s good pleasure for all the fullness to dwell in Him, 20 and through Him to reconcile all things to Himself, having made peace through the blood of His cross; through Him, I say, whether things on earth or things in heaven. 2. He died so we can have eternal life. 11 And this is the testimony, that God gave us eternal life, and this life is in his Son. 12 Whoever has the Son has life; whoever does not have the Son of God does not have life. 3. He died so we can be forgiven for our sins. My little children, I am writing these things to you so that you may not sin. But if anyone does sin, we have an advocate with the Father, Jesus Christ the righteous. 2 He is the propitiation for our sins, and not for ours only but also for the sins of the whole world. That word ‘propitiation’ means that he satisfied a requirement for our sins. Our sins come at a cost. A cost that had to be paid. And if you don’t know Christ, you still owe that debt, but there is good news! 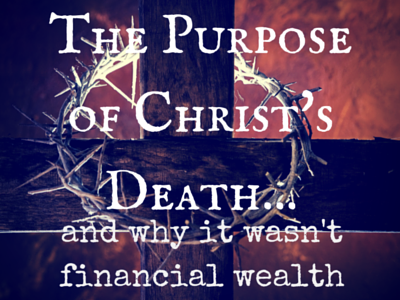 Christ’s sacrifice was a lot more glorious, eternal, and urgent than financial wealth! I’ll save all the warnings about going after riches for another article. I’ll also add that for the believer, Your Heavenly Father knows what you need and is faithful to provide! Blessings, acquiring wealth, doing well, etc., these are all things that can be good and have their place – but it’s always at least second place (I would honestly even say a comfortable fifth or sixth). And to see someone (who claims to believe as I do) merge the most important event in history, and the most significant event for our eternity, with something so ordinary and terrestrial as financial gain is disheartening.